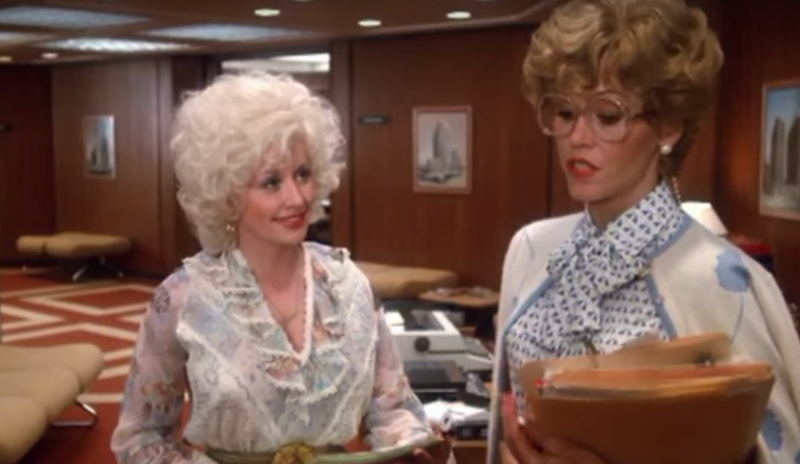 There’s a good chance all of our moms could get together again for a 9 to 5 reunion. At the Television Critics Association summer press tour, Dolly Parton discussed the possibility of appearing on Grace and Frankie, the Netflix series that features her two Nine to Five co-stars, Jane Fonda and Lily Tomlin, in the title roles. “I told them whenever I get a little block of time, I’d love to come be on the show,” Parton said via the Hollywood Reporter. “We always talked about a [9 to 5] reunion.” It has been almost 35 years since the trio appeared onscreen together. Don’t you love how they are all still friends? Though Parton hasn’t yet tuned in to the show, which stars Fonda and Tomlin as two frenemies whose relationship changes after their husbands leave the two women for each other, she did know enough about the storyline. “I don’t know what my husband [on the show] is going to turn out to be, but we’ll figure it out,” she said. Parton was at the event to promote Coat of Many Colors, the first in a series of television movies that NBC is making about the country singer’s life. Jolene was recently announced to be the name of the following telepic. The second season of Grace and Frankie will premiere sometime next year. Image via 20th Century Fox/screencap.